"Indeed!" *nods in approval* "Soumya Mukherjee it is!" I don't know where in the blog I should put the best moment of my life, at the top or I should have saved it to be revealed in the end. But going by the fact that most you who follow my social updates are already aware of this, I decided to go by my former choice. It has been a long long time since I blogged- the second to the last one made me feel relieved of the stress I was dealing with during my vacation. But I had made a pledge that, after the blog-birthday post, I will return as The Rambler only when I get placed. I wanted to share my success story. So take this as a combo of self-experience as well as those 'fancy' posts for people who will appear for Deloitte in the coming days(and I would want the latter to happen more as it would get some good number of hits), here we go!
" Can you arrange for a slide-changer, Soumya? " "Sir we don't have one." I replied. "Uh, okay, well I hope you have a collar mic ready?" "Fine Soumya, that would do. And we would be reaching your campus soon, and will start with the presentation right away." The presentation was , as I would like to put it, a class act. I have always heard from my seniors that Deloitte people are known for their interactive sessions, but what I saw was something that was truly worth applauding (no exaggeration here). The barrier between the Interview Panel and the students was broken in no time and soon we were interacting as a team. That is what Deloitte is all about- people. Deloitte was the 12th company that I was handling, and I would confess that theirs was THE most amazing presentation I saw so far. I had some doubts regarding the technical facades of this new profile they were offering- Enterprise Risk Services- but soon they made it very clear that their domain was Technology Risk Services, with providing scenarios using the latest technology for their clients that would make a client's system fail- thus pointing out the loopholes in the client's system, and implementing, maintaining the solutions provided. I realized, that there was no looking back from there. I started giving some really smart answers in the presentation, to ensure that they took note of me (shamelessly I confess yet again) for future reference. Because it was not just about getting selected- it was about getting selected in one of the most coolest company that we have known, and it was about getting selected in the company that was my dream for the past two years. After they discussed the CTC, it was time for them to take questions from us. And I was waiting for one particular, final moment for which I had prepared the whole night before the process. And it was as if God had listened to me. Someone from among the crowd asked, "Sir what does the 'green dot' in the logo mean?" The HR person shot back, "Let me ask you, what does it mean?" Pat started flooding of replies,"GreeneryEnvironmentalFriendlyEcoFriendlySoothingGoodHonesty" and when the chaos stopped, I started, "I would like to add, the dot signifies symmetric growth, and since all the other letters of Deloitte were of the same color (blue), that showed that everyone in Deloitte worked together, as a unit, to produce the output, that is, the green dot that follows at the end of the logo, indicating symmetric growth in all aspects." "That is a brilliant answer. Consider yourself just one step away from the offer letter." the HR guy exclaimed. 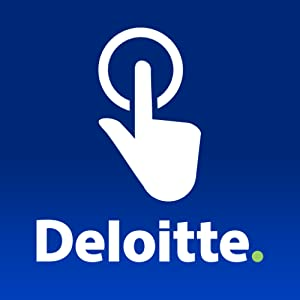 I would suggest everyone preparing for Deloitte interviews, that don't take this as a standard answer- the logo is an abstract and awesome style of branding that allows you to think, so you HAVE to be creative with your answer to this question. Bottomline: It makes you think, so you see, the logo stays in your head! Smart, ain't it? Anyways, after a lot of hooting etc., the presentation concluded. I asked the students to settle while we arranged for the group discussion rounds. In a short while, we started off with the GD , and I was running around hitherto to ensure the process went smoothly. Here I would like to thank my fellow Placement Coordinators Akshat , Abhimanyu, Sahil , Himanshu and Devaang for being there just to make sure that my workload was minimal, as after all, I was also appearing for the process. "Aaj tu SPC nahi, aaj tu ek shortlisted student hai!" "Baith jaa chair pe AC ke neeche, aur teen lambi saans le!!" you are the best, people! Our group was Group No. 6, and we started our discussion on a highly positive note. The best part about our group, what we all realized was, we all had some unique idea to contribute. Yet it was cluttered in the end, when the moderator asked us to come back in a short while to present our final solution. I forgot to add that it was a case study round. I realized that we might have messed up a bit, so I suggested to organize our points. The 9 of us subdivided ourselves to 3 teams of 3 members each, one the Analyst team, the second the R&D team and the third the Publicity & Sales team. After discussing who would say what, and working on issues as small as how to notify the current presenter in the Group if he/she exceeded 1 minute of his/her allotted time (the person next to the speaker would tap his/her feet; we had to take this measure as every group would be given 10-12 minutes of time to present the solution). Funny as it seems, it was exciting to take decisions on-the-spot. We returned to our room. Started our presentation. "Your ideas were cluttered during the discussion" the moderator said. "Sir , we have organized our thoughts this time and hope that you won't be disappointed" I said. It began. We executed as we planned. Everyone did his/her part- presenting individual points , and , alerting the current speaker of the time limit. I was so much enjoying the session. After we wrapped up, they asked us some questions, and we were asked to leave. It was a good Case Study round. They selected 13 finalists from the 81 students(there were 9 groups in total) for the interviews. I was topping the charts literally. He he. Since I was the first one to go in, I was losing my confidence somewhat. "Relax Soumya!" the HR dropped by in the room and left. "Y-Yes Sir, thank you!" I was realizing that I was not doing it right. The interview began. They were two interviewers in the room (including my previous moderator, the senior-most panelist of the team). Normally you expect them to ask you about yourself. But I learnt a good lesson that day: Never go inside that room with a mind-set, expecting the sequence of questions. Because it will never work. "So in which school have you studied in Kolkata?" he asked. I was not expecting it to start this way, as I stated before. But I got a grip on myself, and started answering. "K.V. Ordinance Factory Dum Dum , Sir." I said. "Ohh that must be the place where the NSCBI Airport is, right?" "Yes Sir, just 15 minutes from my home." I was a bit relaxed. And when I get a little relaxed , I start blabbering. "So Soumya, tell me about your internship." "Ahhh..finally!" I thought. I explained how I worked on modular programming, developed linux device drivers etc., and what challenges I faced. Mostly they checked my confidence. Then they switched to Computer Networking, where I struggled a bit. But I picked up when they asked me about my favorite layer, and asked me to explain in layman's language, what MAC layer(my favorite layer) did in Networking Model. I was able to satisfy them with my answers. Then they asked me about databases, and I was not happy with my response. But one good thing that happened is that in the end, they asked me if I knew Data Structures. It was the best ME GUSTA moment for me that day. I knew Data Structures? Man I LOVED DATA STRUCTURES!!! I was on cloud 'nlogn' when I replied, "Yes Sir." so they gave me some problems, some basic concepts on linked lists , stacks etc. This spell went quite well for me, though I might have shown over-confidence here and there. Then they wrapped up by asking, "Soumya, do you know recursion?" "Huhuhuhuhuhuhuhuuuu!!!!" I was going to blurt that out like an idiot. "Yes!" I went. "So can you write a quick recursive code to find factorial of a number?" he asked. The second best ME GUSTA moment for me. It took 21 seconds for me to write that code that forms the basis of all recursive function examples that we compu geeks cover in our courses. I was a bit unsure but I gave an overall 7 on 10 to myself as the interview got over. I again started roaming here and there ,occasionally playing Plumet 2 and by this time, a good crowd had grown outside the waiting room of the Placement Cell as the panel was on the verge of finishing their interviews. I was fooling around, bragging how well I interacted during the presentation when the HR called me for a second round of interview. "But why?" I wondered. This time I decided I will say a clear 'No I don't know Sir' to whatever they asked that I had no answers for. The second interview started off well. With questions like "Why Deloitte?" "What are your qualities? ", I was taken, once again, to the intricacies of Networking Concepts. "The OSI Model" he began, and I was quick: "Sir, I forgot the two extra layers that were there in the OSI Model but not in the currently used TCP/IP Model." Seemed as if I was determined not to try too. But they were calm, and asked me, "Okay which all layers do you know? Just define those layers one by one, and explain Transport Layer a bit more." I was good this time with my response. Next they asked me, again, about my internship. One note: Do some real good work in your internship, that will help a lot. I worked with Drivers, so naturally they asked, "Okay let's discuss Virtual Memory." Ah! So much for the famous non-tech interviews of Deloitte. "Ankita teach me Virtual Memory please?" my good friend and batch-mate Ankita Mathur got placed in C-DoT a day before, and was fluent with OS concepts. "Ya ya kiddo I got my notes, it will take an hour or so I hope." "Great!" I said. "But you will have to throw your phone away if we get a single ping in the middle." she never means what she says, except for the awesome things she says- about me. He he. The Virtual Memory session started flashing in my virtually non-existent memory and I cannot forget how well it was from then onward- they asked me LRU, variations on page table, implementation etc. and I answered almost all of them well. They asked a few questions on Database and finally they asked me to show how to delete a node from a Doubly Linked List, which is the easiest thing to happen to a Data Structure fanatic! This round sealed my chances. After the final few interviews got over, it was the time. I had a gut feeling that I am through, but then, going by the previous companies I had sat for, I was thinking, "What if..?" trust me, this is the worst time of your life...and the best time as well. My buddy Shubham was persistent that I am through. More rounds of Plumet 2 followed. The HR came out with a list. He gave a brief concluding speech and opened the list. He started announcing the names. 1..2..3..4..5..and 6. Cheers and hooting followed after every name. He stopped after the sixth name and looked into everyone's eyes, including me (who was standing at the front). And then the moment came. The best moment of my life. Shubham was close by the HR guy. He had read all the names, and tried hiding his reaction the best. But Devaang Jain, my fellow SPC, gave me a quick glance with gleaming eyes. I later saw that my name was on the top of the list, and they did this on purpose. Deloitte. Proud to get in. And Deloitte well seems cool. Hardly know you but still very happy for you. i am literally jealous of you.....not, for you are placed in the Deloitte , but for the way you write these awesome blogs.........i wish i could do the same.....anyway, how do you manage to do all these things? 1. I just prioritize blogging.